Saturday July 10th, Ms Foxholski, Kings Lynn Arts Centre, Gig 2004 Festival. 2/2/04 The Ferryboat, King Street, Norwich. 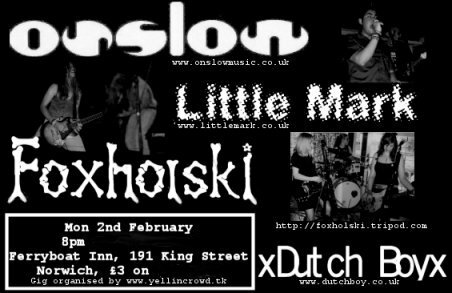 Foxholski, Onslow, Little Mark and Dutch Boy. Gig organised by www.yellincrowd.tk promotions. 10/07/03 8pm, The Ferry Boat, King Street, Norwich. 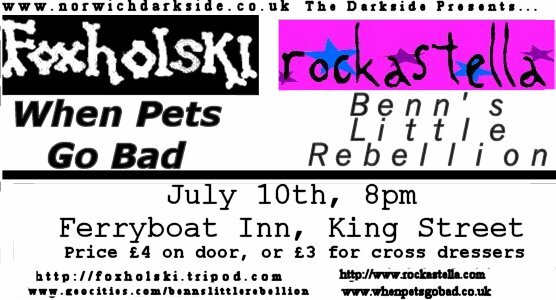 7/3/03, 8pm, The Ferryboat, King Street, Norwich. 12/16/02, 9.30pm, The Bank, Prince of Wales Road, Norwich. Foxholski and /Oblique/. Self-organised debut.